When I was little, chocolate mousse was by far and away my favorite dessert. This is because I’ve been pretty much obsessed with whipped cream my entire life (I actually have to work really hard to control this love affair by not buying cream too often! In college my roommate and I would make vanilla whipped cream and eat it straight almost every night, yikes.) Chocolate mousse, seemed to me basically rich chocolate whipped cream that you could then top with vanilla whipped cream, just for good measure. Now, it turns out that most chocolate mousse recipes require either raw eggs or gelatin or both. Gelatin, especially, I’m just not ready to mess with. It’s way too easy to screw it up and wind up with a dish that’s full of little frog-egg like jelly chunks. And raw eggs, well, I do get a teensy bit squeamish. But, when I was studying in Paris, I attended a class on chocolate pastry and dessert making at the renowned Maison du Chocolat (I, rather brilliantly I must say, used the cultural money that the school gave us for doing things like visiting museums). The instructor of the class taught us how to make a quasi-chocolate mousse based entirely on whipped cream. HEAVEN! I immediately declared the man my hero for all time. This mousse can be used instead of frosting in layer cakes, or as part of a trifle. You can layer it with berries to make what is known as a fool, or fill little pre-baked tart shells with it. Or, my personal favorite, you can eat it straight up with a few chunks of chocolate on top, as a ridiculously decadent, rich, creamy, chocolate mousse. Add about 3/4 cup cream in a saucepan over medium-high heat. Bring just to a simmer – there will be vigorous bubbles all around the edge, but not quite in the middle – then take off the heat immediately. Pour the chocolate into the hot cream and allow to stand for a couple of minutes. Use a whisk and slowly start to stir in the middle of the mixture with small circular motions (incidentally this is the same technique you use to make ganache for truffles, except you’d use more than twice as much chocolate). 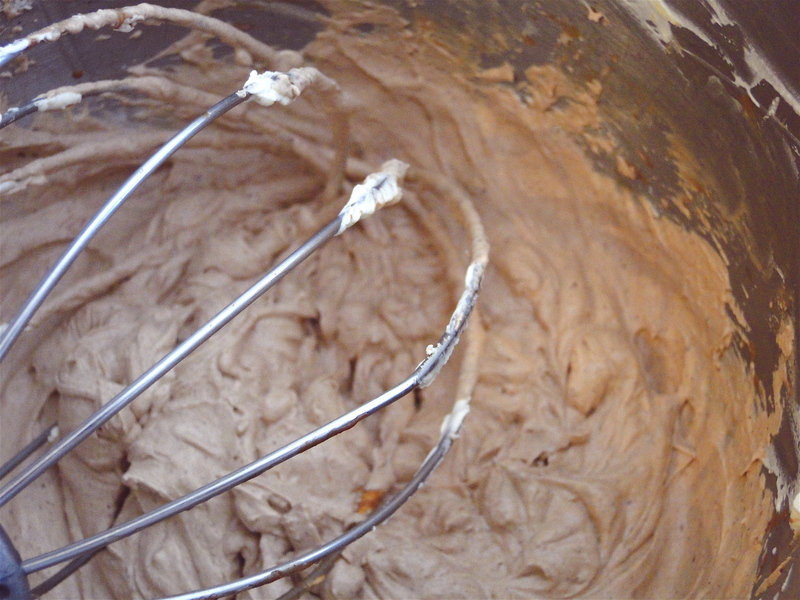 Continue stirring in small circles as the chocolate begins to mix into the cream in dark streaks. 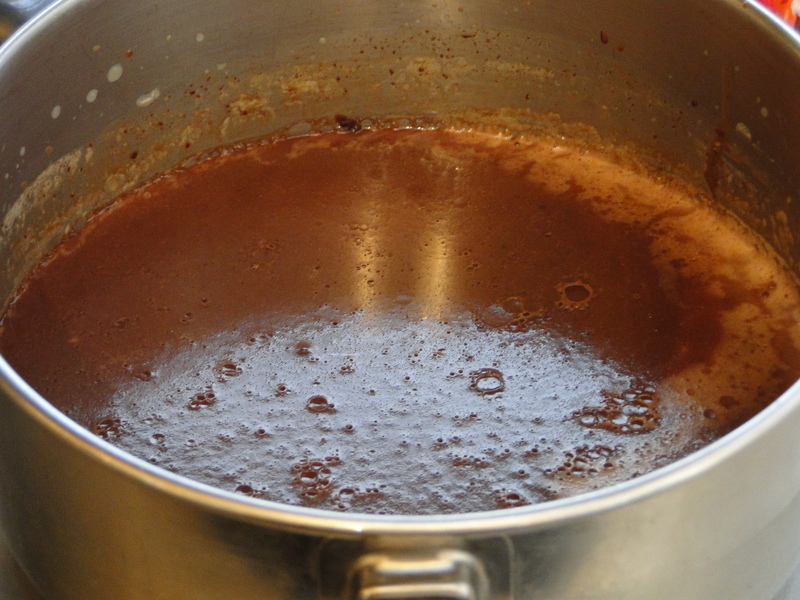 Slowly begin to stir in larger motions and stir until the mixture is a uniform brown color. Allow the chocolate and cream mixture to cool to about room temperature – it will thicken in the process. In the meantime, chill the rest of the cream. When everything is cool, add the chilled cream to a bowl with the sugar and vanilla and beat with an electric mixer (or whisk extremely enthusiastically by hand and be prepared to have a very tired arm) until soft peaks begin to form. Then, scrape in the chocolate cream and continue to beat until the all of the cream is light chocolate colored and forms stiff peaks. Cover and chill in the refrigerator until you’re ready to use it. But, don’t forget to lick the beaters – cream must not go to waste! You are currently reading Creamy Chocolate “Mousse” at Five And Spice.